Great post! 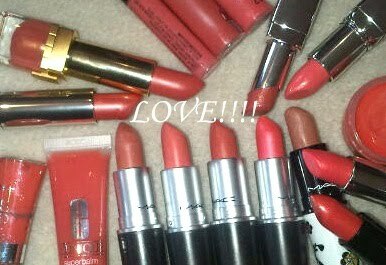 You should def do these more often =) I love coral lipsticks. I tried costa chic on at the counter and it wasn't what I expected. It looks amazing on you, so maybe I will go back and give it a second try. Oh Tali I miss your blog too! So, so much! You have been such an inspiration during my time blogging. 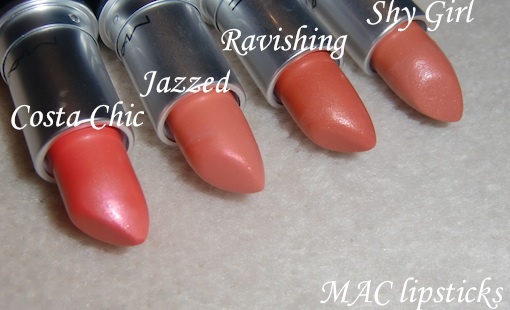 I'm loving coral lips too, jazzed and ever hip are my favourites. I need to have a look at Costa Chic and Shy Girl I think, very pretty! Yey! You're back...sort of, lol. It's good to hear from you. Do consider bringing the blog back! wow.. this post just made me miss tali's blog even more but im glad your gonna post once in awhile here! Great post! 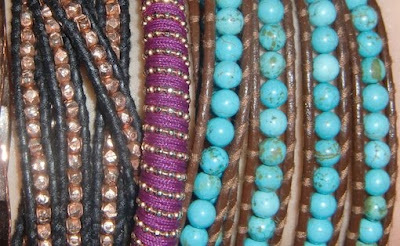 Thank you so much Tali :) I ♥ Costa Chic too. What a lovely surprise, yay!!! I enjoyed reading theGlossGoss blog so much, and the vlogs on Youtube were a treat... I'm so glad you're back Tali, even for once a month! Kisses to you girls both!!! Aww so lovely to hear from you Tali! We miss you so much! Come back pretty please ;) My fav deffo has to be the Shy Girl Lippie, looks like a lovely shade that may just suit my skintone :) Totally love the rose gold on black bangles! Great post hun! Tali - reading your post is so bittersweet - I *LOVE* seeing your lovely pics again and hearing all your thoughts - but I miss your blog *SO* much, it's not even funny! Who would have thought I'd get so addicted to reading your posts! I wish you'd come back to regular blogging - even if it was a very impersonal blog...although I love reading abour your life and seeing your pics, I understand how intrusive the attention from that can be. i swear by the 3 step system & costa chic looks gorgeous! Great post Tali :) I think I need to get a coral lipstick! I spy a shopping trip (with cake ;) Love the bracelets too (although my bank balance won't ;) ) Re Clinique, I found it dried my skin lots and actually made my skin product more oil! Agh! What a great post, I'm on a total coral binge too! I hope you are well and Mitzy is too! ..Tali's blog was my only weekly glossy magazine ..really miss that ..
OMG Tali, you HAVE to come back. We all absolutely miss your blog. Maybe just blog once a week/fortnight if it was getting too much. Oh and as for those coraly/peachy lipsticks, they're all divine! Hey Tali it’s so nice to see a post from you, thank you for doing this guest post!! As you can all see we all miss your blog very much, you HAVE to come back! Tali! I don't know why you deleted your blogs but I thank you for coming back via your blogger friend. (Thanks Bubblegram!) I miss your posts, both fashion and makeup. Well, I also miss your recipes and life report in general! I've missed your blog posts Tali! Please come back!!!!! Or at least, guest post more often!?! Hope you're doing well and best if luck with everything! Hey, Tali! Please come back, I just need my fix of your bloggg! 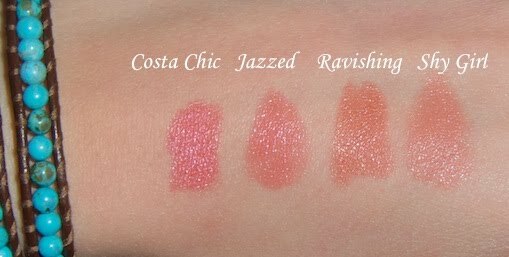 :) Great post here, I wish there was a way I could find the Jazzed lipstick somewhere, looks sososo pretty and I have been drooling over it for a while now. But, most importantly, please come back to blogging or do these guest posts more often. And thanks, Muhsine, for convincing her to do this. Great to hear from you Tali!!! Now there is even more to look forward to on Muhsine's blog! OMG I love those H&M dresses!! Please come back Tali i miss your blogs so much, Through you i bought rouge bunny rouge, dior diamond powder, rouge voluptes, becca skin perfector to name just a few. You were the highlight of my day when i saw a new post from you. awww so happy to see a post by tali, we love you! i've missed Tali's posts so much! Thanks for all your lovely comments guys!! :) Will see you in a month or two with another post! awww great post! I've always wanted to try the vita coco water..
Glad you have agreed to do guest posts Gloss. I have missed your blog, but ya gotta do what ya gotta do. Tali! I miss your blog.. come back!! 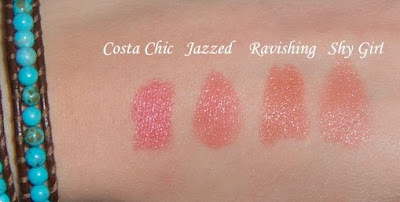 Shy Girl, Jazzed and Costa Chic are some of my favourites (wish Jazzed was a permanent one!). And for anyone wondering, they are all great if you have fair skin - I'm NC10 - 15. Hey Tali welcome back! So happy to read from you again. Yay Tali! I miss your blog so much, it was my favourite, but I can empathise with why you did it. I'm glad to see someone else is into the packing stacks of bracelets and beads onto their wrists, I'm addicted! I'm so pleased to see that you've joined up with Muhsine, makes me love Bubblegarm even more. I'm sp happy to read u, Tali!! Thanks to Bubbegarm for hosting ur posts from time to time!! I've missed your blog Tali! It was one of the main ones I liked to read. 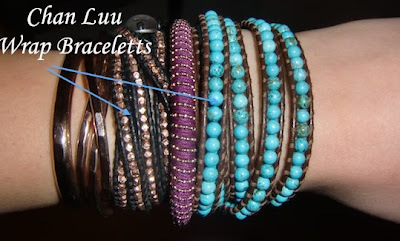 Loved the post :) I love coral too, it's such a gorgeous colour. come back tali, we love you!!! Hi Tali! You sure make it hard to find you! (Yes, I searched!) I'm sorry you quit blogging, but I'll take a guest post now and again. How's Mitzy doing? It's been so long since I've read your honest, witty reviews! It's nice to read a post from you again! Oh I love looking at those bright, fun lipsticks! I just MAC's pro longwear lipstick in Good to Go and its a gorgeous bright orange/red I love it! I am getting more into corals rather than pinks lately. 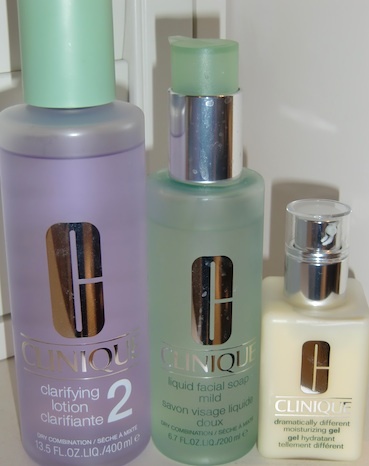 I also used to work for Clinique, I agree the clarifying lotions are strong and the key is using a level that works, 2 and 3 are the best for most people. Clinique is so good for oily skin, I also really love the spot healing gel and t-zone shine control for summer. Tali you write the best posts! Tali, I'm so glad that you're blogging here again. But still I+m waiting for you to come out with your own blog again ... every day I remember yo and your blog and I also do miss your videos on youtube.